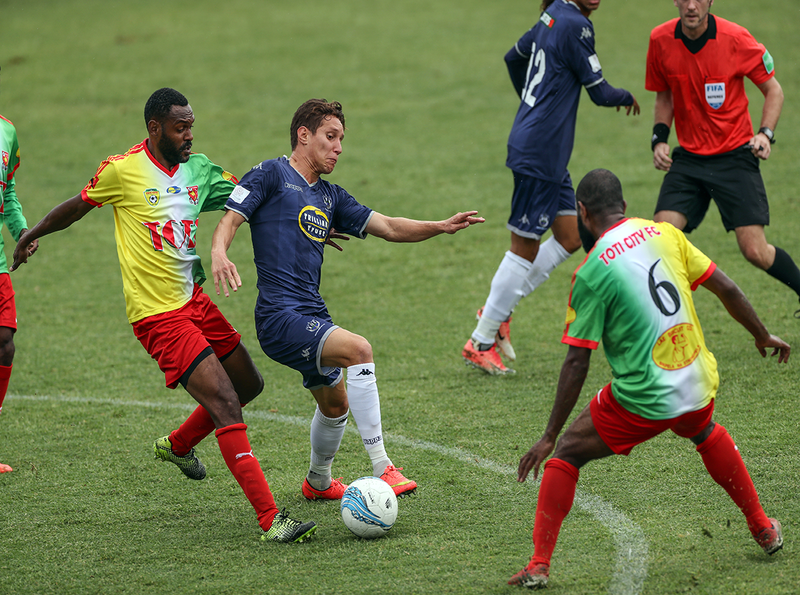 Nine-time champions Auckland City FC have become the first team to book their place in the OFC Champions league 2019 semi-finals with a clinical 4-0 win over Lae City Dwellers from Papua New Guinea at Freyberg Field on Kiwitea Street. In a grey and rainy Auckland day the hosts have started patiently holding possession to control the tempo of the game. Lae City ‘s well organized defence pressed high to stifle Auckland’s attacking ambitions while also showing plenty of promise on the counter as Nigel Dabinyaba and captain Raymond Gunemba kept linking up at the other end. With the game developing into an evenly contested arm wrestle, Auckland’s Papua New Guinean international David Browne found himself at the end of a perfectly executed through ball from Mario Bonsu-Maro before chipping the ball over Ronald Warisan to break the deadlock in the 41st minute. Despite Browne’s muted celebration there was a clear sense of relief amongst home supporters who were delighted to see their team taking the narrowest of leads into the break. Lae City coach Peter Gunemba made a couple of half-time changes to get back into the game, but he was left to rue his players’ lack of concentration after the restart as Browne grabbed his and Auckland’s second following a wonderful individual run and a well taken drive straight from kick off. Conceding so early in the second half was a hammer blow for the Papua New Guineans who were lucky not to be three down in the 66th minute when Fabrizio Tavano hit the bar with a piledriver. However, 12 minutes later the result was finally put beyond any doubt as Te Atawhai Hudson-Wihongi headed home from Tavano’s corner. David Browne put the icing on the cake for Auckland by grabbing his hattrick with a sublime shot from the edge of the box in the 87th minute. Auckland City coach Ramon Tribulietx coudn’t hide his delight with his side’s professional display. “We have dominated the game completely with the ball in difficult conditions,” said the Navy Blues coach. “Lae were very aggressive in the first half and throughout the game, pressing very high which made our life very difficult during the opening exchanges. “But once we understood their game plan we started to create chances and especially in the second half we were clearly on top,” stated Tribulietx. The Auckland City coach was also pleased with his side’s ability to score goals at critical times including the opener at the end of the first half and the second straight after the break. “That shows the maturity of our team, it showed that we stuck to our style and we were patient and we didn’t panic when we couldn’t create. “We knew that sooner or later we were going to get through and score and that was the case,” he said. Meanwhile, Lae City coach Peter Gunemba has admitted Auckland City were deserved winners. “Auckland City are a very good team, they are nine-time Oceania champions and when you play against a good side like that you have to be at your very best,” he said. “We’ve played really well in the first half for 40 minutes but when the first goal went in the boys have lost concentration. “We tried a double substitution at the half time break, but our game plan went wrong. “My players are seem to be making the same mistakes over and over again, they lack concentration when they enter the field, the second goal came less than one minute after the re-start and that was a killer blow,” explained Gunemba. In the final four Auckland City will face the winner of the last quarter-final between Tahiti’s AS Central Sport and As Magenta from New Caledonia and Ramon Tribulietx is expecting another stern challenge. “It’s going be a really tough one especially since it’s a one- off game, it’s a final away from home which will make it very tricky. “We played Magenta in the group stage, we won 2-1 but it was a very hard game especially in the second half and Tahitian teams like Central are always very difficult and physical, so it will be very tough,” said the Navy Blues coach.